Back in July I went to San Francisco and while I was there, I decided that I need to write a book. The purpose of the trip was a conference through the National Council for Community & Education Partnerships for a college/career program called GEAR UP. My nonprofit is a GEAR UP partner with our local school district. We work with 360 students to help them navigate all the challenges on the path to graduate high school successfully. There were lots of great workshops at this conference, but 2 particular sessions back to back, got me all fired up. First was (yet another) session on "Parent Engagement" followed by a session on how to “revamp, renovate, and reinvigorate,” the educational system in America. I couldn’t stop thinking that the presenters in session 2 were missing the whole point of session 1: without parent engagement, the system is nearly always going to fail. During the system revamping session we heard a lot of theory. We heard about lots of books and research into how students succeed or why they don't. We heard about promising programs and approaches to engage and motivate students. In the end I was left with the nagging suspicion that they were all ignoring the root cause problem of inadequate parenting. For decades, the education system has been swimming upstream against a current that is going to take it completely down eventually unless something changes positively with regard to this root cause. The entire education system teeters on the premise, once valid, that parents will get their kids to school. That parents will ensure kids study. That parents will insist that kids respect their teachers. When the system breaks down, it's because the parenting linchpin is faulty. The system can work and work and work and theorize and pilot and innovate itself to death, but until it accepts that it can't work around the broken parenting system, no real progress can be made. Only band aids will continue to be put in place, often expensive band aids. There are no true answers that don't involve proper parenting, unless the next step for the education system is to evolve into a 24/7 boarding school. There was so much PASSION at the conference around helping kids succeed in school and life. 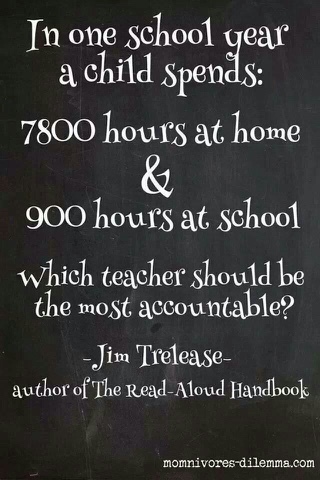 And so much talk around about how to work around inadequate parents. Most of the many "parent engagement" workshops I have attended over the years are historically weak, and the efforts ultimately futile because the goal with parents isn't ever to teach them how to be good parents, but how to do specifically what the school wants them to do for their kids at a moment in time. We want to give parents tasks instead of tools. And we don't start early enough to teach parents how to be good parents. The current drive for more pre-K programs is a painfully inadequate response to all the not-ready-for-Kinder 5-years olds showing up in public schools. In a few years we will start to look backwards even more to develop a program in response to all the 3 and 4 years olds showing up not ready for pre-K.
We've let the education system get this bad by refusing to accept that the root cause of student failure is actually insufficient parenting. It's not the teachers, or the textbooks, or the facilities or the school polices or student motivation that is the real problem. If we resourced all the reasons parents lack parenting skills at the same level that we have endlessly and fruitlessly resourced the education system, things might be different. Why don't we see this? This is what I need to research and think more on, but I suspect it is a combination of helplessness and judging. We develop school based programs because we can control what happens in the school. We don't develop home based programs because we have so little control over what happens there. Control and access. Plus we tend to ruthlessly judge poor parenting - as if everyone should just know everything the minute that baby arrives. Shortly after I attended this conference and was struck by a desire to learn more about the breakdown between parenting and the education system and write about it, I saw a video on Facebook called “Technology has high jacked family dinnertime. Watch Pepper hacker reclaim it.” Basically, the parents in this video appear to have no authority over their kids’ use of smart phones and tablets at the dinner table so they must resort to using a device that surreptitiously interrupts service - a device disguised as a pepper shaker. Pepper shaker as parent. It is no wonder that schools are having to feed, clothe and discipline kids today. If parents can’t make kids put away their phones during dinner, how can they be expected to make them do their homework? Or even go to school at all? If this is the future of parenting, America is doomed. As a high school teacher I am often held responsible for student success when I know that the parents have much more accountability. Teaching parenting seems to be something we have completely left out of the equation. Its crazy how we just expect parenting knowledge to appear in mom and dad brains.